We have all the Easter Egg Hunts and where to see the Easter Bunny in Akron, Ohio Area in one handy post! Find Easter Egg Hunts, Picture with the Easter Bunny, Easter Passion Drama, Easter Brunch, Breakfast with Easter Bunny, , and more in the greater Akron, Ohio area! Many Easter Events are FREE! Share this post with your friends and family! The Easter Bunny will be at Summit Mall for Picture with the Easter Bunny at Summit Mall between now – April 18, 2019. The Easter Bunny will be at Chapel Hill Mall for Picture with the Easter Bunny at Chapel Hill Mall between April 13-20, 2019. Mall is closed Easter Sunday. The Easter Bunny will be at Belden Village Mall for Picture with the Easter Bunny at Belden Village Mall between now – April 20, 2019. You’ll receive magic Easter seeds and items from Sky Zone. Tetelestai is a contemporary musical portrayal of The Trial, Execution & Resurrection of Jesus the Messiah. This is a prayerful re-enactment of Christ’s sacrifice and triumph over death. The performances are held at various locations this Easter Season. You are invited to an epic Eggstravaganza at Christ Community Chapel in Aurora, Ohio on April 13, 2019 at 10am. Enjoy snacks, inflatables, photo booth, bunny hop, and Easter Egg Hunt. Kids 10 and younger are invited to FREE Stow Easter Egg Hunt on April 13, 2019 at 10:30am. Enjoy an Easter Egg hunt, light breakfast refreshments, and meet the Easter Bunny! Join the Easter Bunny for photos and an Easter Egg Hunt in Streetsboro on April 13, 2019 rain, shine, or snow at 10:30am. Enjoy free donuts while supplies last and bring your camera for picture with the Easter Bunny. Spring Lamb Egg Hunt Brunch and Spring Fling at the Spicy Lamb Farm in Peninsula, Ohio welcomes you to celebrate new life of lambs, bunnies, chicks, and ducklings on the farm. Brunch and Egg Hunt from 10am. Public event and shearing begins at noon with Blessing of the Sheep at 1pm. Rain or Shine or Snow! Dress for the farm with boots! Read our review on Spring Lambing Days. Private group visits available. Check out the Free Magic Easter Egg Hunt in Barberton, OH on April 13, 2019 at 11am at Newton Park. There will be age group hunts for kids 12 years old and younger. The FREE Tallmadge Easter Egg Hunt is on April 13, 2019 at 10:30am SHARP for kids ages 2-12 with age divided hunts. Bring your camera for a picture with the Easter Bunny! Enjoy a FREE Easter Egg Hunt at Hartville Marketplace on April 13, 2019 starting from 10am – 12:30pm. This hunt is for ages 12 and under. There will be a new hunt for people of all ages with special needs too! Hosted by Love Our Community. Enjoy a free family Easter Event at Michael’s with a festive scavenger hunt the chance to win a $5 off any toy purchase coupon at the end with the whole family on April 13, 2019 from 1-3pm. The Adult Easter Egg Hunt in Solon is on April 13, 2019 from 6-10pm. Cost is $25, includes BBQ Dinner, 3 drink tickets, One entry into Grand Prize drawing, -Easter Egg hunt that will includes prizes for drink tickets, grand prize drawing, door prizes, and more! Purchase tickets via PayPal – [email protected] ‘Pay Person’ – not ‘Business’ or direct message on Facebook.. Toddlers are invited to Hop & Jump with the Easter Bunny and hunt for eggs at Easter Bunny & Egg Hunt Toddler Time at Sky Zone Boston Heights on April 14, 2019 from 9:30am – 11am. Enjoy a Picture with Easter Bunny at Cafe O’Play on April 14, 2019 from 1-2pm and on April 20, 2019 from 11am – 1pm. Get your picture taken with the Easter Bunny at no charge with your regular weekend admission. The 6h Annual Adult Egg Scramble is on April 19, 2019 starting with a pregame at the Roy Smith Shelter house from 6:30-8:30pm with karaoke, food truck, more prizes, and more. Egg hunt beings at 9pm at Fred Fuller Park in Kent, Ohio. There will be 6,000 eggs filled with candy and prizes ($5,000 in prizes! )- including a Big Screen TVs, Bikes and Kayaks, a Drone, Nintendo Switch, and CA$H in the golden eggs. Cost is $15, register online. 18 and older only. Enjoy a wet and wild Easter Egg Hunt in the LifeCenter Plus indoor pool during Aqua Easter Egg Hunt in Hudson on April 19, 2019 at 11am. After the egg hunt, enjoy a snack in the cafe and pictures with the Easter Bunny. Each child must have a parent in pool with them. FREE for member and $5 for nonmembers – use the day pass all day. Enjoy a pancake breakfast, admission to Akron Children’s Museum, indoor putt-putt, picture with Easter Bunny, and Easter Egg Hunt at Lock 3 Live Easter Egg Hunt on April 20, 2019 from 9am – 11am. Children $12, Adults $10. RSVP 330-375-2877 or message on Facebook. 2nd Annual Easter Egg Hunt at Case-Barlow Farm in Hudson is on April 20, 2019 at 11am. Hunt will be divided into age groups. Reservations appreciated. Email your reservation for your children and their ages to [email protected]. The Kent Easter Egg Hunt is on April 20, 2019 for ages 3-9 (with 4 age group hunts) at 1pm. Easter Bunny arrives at 12:45pm at Fred Fuller Park in Kent, Ohio. Over 5,000 Easter eggs, some with prizes! Residents of Green are invited to the Green Parks & Recreation Easter Egg Hunt on April 20, 2019 at 1:00 p.m. The event is at City of Green Central Administration Building and Central Park. This Easter egg hunt is for infants through age 10 that are residents of Green. Limit of 6 eggs per child. Please register with the Parks & Recreation Office, Monday through Friday, 8:00 a.m. to 4:00 p.m., 330-896-6621 or online at www.cityofgreen.org. Parking at Kids Country or the Green Intermediate School. There will be 6 Cuyahoga Falls Easter Egg Hunts in Cuyahoga Falls neighborhoods on April 20, 2019 at 10am. NO hunt at Water Works Park. Each of the egg hunt locations will have colorful candy and toy filled plastic eggs for kids to find with all age groups participating together! Hop over to the Wedgewood United Methodist Easter Egg Hunt April 20, 2019 at 11am. Easter Egg Hunt Age groups, up to the fifth grade, have their own areas. Rain or Shine! Attend Easter Services at the Wedgewood United Methodist Church of Akron and enjoy a free Easter breakfast at 10:30am. 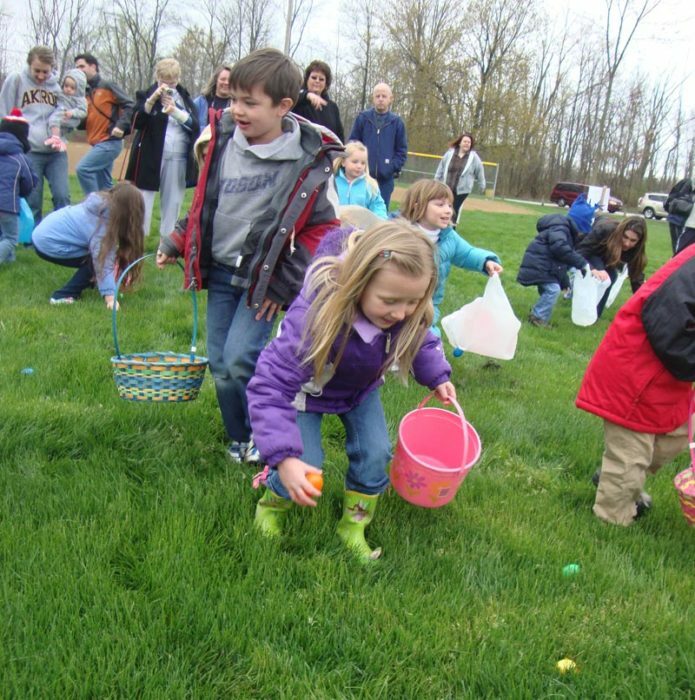 Hop over to Riverwood Chapel for Free Easter “Egg”splanation Hunt in Kent, OH on April 20, 2019. The Easter Egg Hunt will be in the church front yard with an explanation of the significance of Easter starting at 11am. Ages 12 and under. Bring your baskets and get ready for the FREE Easter Egg Scramble at Twinsburg Fitness Center on April 20, 2019 at 11:30am. There will be 2 age groups: 2-4 starts at 11:30 and 5-8 starts at 11:45. Arrive at least 15 minutes early. Bring your swim suit for FREE Wet Easter Egg Hunt at Twinsburg Fitness Center on April 20, 2019 at 12pm. There will be 2 age groups: 9-10 starts at 12 and 11-12 starts at 12:15. Dive for toys and prizes. No parents permitted in pool. Kids ages 12 and under can attend the free Salvation Army Easter Egg Hunt on April 20, 2019 at 10am. All kids will receive a bag of Easter candy. Meet at the West pavilion of the parking lot. Egg hunt will be divided by age. Enjoy a guest appearance by the Easter Bunny at 10am on April 20, 2019 at the Easter Egg Hunt in Sharon Township, OH. Visit the Easter Bunny at 10:15am. Easter Egg hunt starts at 11am. Bring your own bucket or basket to collect eggs, once candy is removed, please recycle eggs back to the township for next year. Miss Hickory’s Tea Room Annual Easter Egg Hunt includes a brunch before the Easter Egg Hunt for $15 per child. Each child will receive a basket, 5 tickets for 5 eggs, 1 golden egg, and Easter cookie. RSVP (440) 668-3053 & make your reservations today! Enjoy celebrating Easter at Journey Church at 3 campus locations. After each service, there will be an Easter Egg Hunt and a visit from the Easter Bunny! Burntwood Tavern Easter Sunday Brunch features Omelet Station, Carving Station with Prime Rib, Ham & Cedar Roasted Salmon, Eggs Benedict, $6 Bloody Mary Bar and $4 Mimosas. Have an NE Ohio Easter Event to Add? If you have an Easter Event in NE Ohio to add, please email me at cindy @ akronohiomoms.com or leave a comment with details below. Thank you! Was this Easter Egg Hunts and Activities 2019 in Akron, Ohio Area List Helpful? If you found this Easter Activities near Akron, Ohio 2019 list helpful, please share on Facebook, Tweet, and tell your friends and family. This entry was posted in Activities, Holiday and Seasonal, Local Events & Shows and tagged akron, Aurora, Barberton, Boston Heights, canton, Cleveland, cuyahoga falls, easter, easter activity, easter events, fairlawn, fairlawn ohio, family activity, Green, Hartville, Hudson, Kent, Norton, Peninsula, Solon, Stow, Streetsboro, Strongsville, summit mall, Tallmadge, Twinsburg, Wadsworth.